Shares of Pfizer may slip in the coming days because of Celebrex losing patent protection. I believe this could be a buying opportunity. Pfizer (NYSE:PFE) lost its court battle yesterday to extend the patent life of its blockbuster painkiller, Celebrex, through 2015. Reportedly, there are five companies clamoring to sell cheaper, generic versions of the drug, with Mylan and Teva Pharmaceuticals leading the pack. As Celebrex is Pfizer's fourth best-selling drug, raking in $2.9 billion in revenue in 2013 and showing stellar growth year over year of 9%, it's understandable if this court decision rattles investors' nerves somewhat. Analysts are expecting generic versions of Celebrex to reduce Pfizer's revenue by $1 billion this year, and possibly $2 billion next year, after all. While this certainly isn't good news, I believe investors should consider the following three reasons to actually buy Pfizer in the face of any pullback. Pfizer is ridiculously big. Last year, the company hauled in $51.6 billion in revenue. So, you should keep in mind that the loss of patent protection for Celebrex will manifest itself as a mere 2% revenue reduction over the next two years, or roughly $0.20 to $0.30 per share from today's high. As Pfizer shares lost $0.44 in trading following this news, I believe it's now baked into the price, and any further downside is an overreaction by Mr. Market. 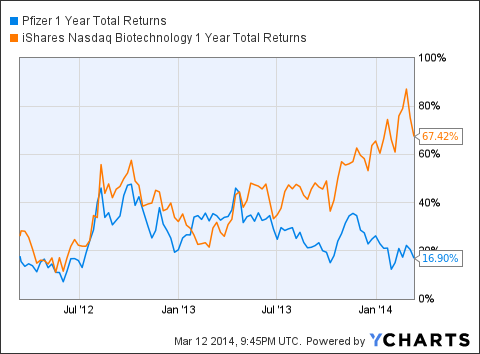 Pfizer is demonstrably cheap compared to its biotech peers. Because of the ongoing patent issues with some of its best-selling drugs, Pfizer shares have not participated in the broader rally among biotechs, at least not fully. A perfunctory comparison of Pfizer to the iShares Nasdaq Biotechnology Index over the last two years illustrates this point nicely. Turning to more concrete measures, Pfizer is trading at roughly four times annual revenue. As I discussed elsewhere, it's not unheard of for biotechs to trade closer to twenty, or even fifty times, revenue in this frothy market. Viewed this way, you have to admit that Pfizer looks comparatively cheap. Pfizer has one of the strongest clinical pipelines in the business. While there are several noteworthy experimental drug candidates in Pfizer's pipeline, you only have to look at the development of more Prevnar iterations, for the prevention of pneumococcal pneumonia caused by different strains of the bacterium, to see a way forward. Put simply, there could by upwards of 90 variations on this blockbuster vaccine. That said, you shouldn't forget about palbociclib, Pfizer's experimental breast cancer drug that reported stellar mid-stage results last month. Although palbociclib is currently in a late-stage trial, there is talk that the drug could be approved early because of the strength of the mid-stage results, and the large unmet medical need for new breast cancer therapies. In fact, some analysts believe the drug could be commercially available before the end of the year, with first year sales entering blockbuster territory. Losing patent protection for a top-selling drug is never a good thing. However, the loss of Celebrex's revenue needs to be viewed in the broader picture of Pfizer's entire business. Viewed through this lens, I don't see it as a big deal. Shares of Pfizer are comparatively cheap and there is good reason to believe that the company's pipeline will more than compensate for any lost revenue from Celebrex. So, you may want to dig deeper into this pharma heavyweight, especially if shares move lower on this news.